When we think of harmony we usually think of sound, music. The tight connection, when right, is very pleasing to the ear. But as we’ve seen, harmony can be a synchronicity. It can be a balance of the cosmos where all the planets align. It is the syncopation of two hearts making one sound (again with the sound!). Harmony can be a point/counter-point, or it could be a precise mating of two things, true and equal. 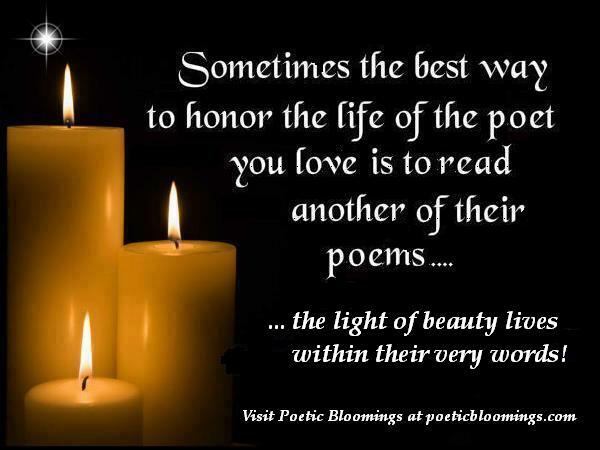 Think of how harmony comes into play in your world and write that thought into a poem! The moon has long since crested, ready to rest in the bosom of day. Silence is the aria of morning, forming in crisp harmony with the symphony of coming light. Night creeps undercover in hopes of recovering her vigor. She has held aloft to guide stars in their journey, keeping pace on her cycle and spurning the tides to dance. But this is her chance to revive for the next new evening to arrive. The sun comes slowly to tuck her in, a great relief, perchance to sleep. The day is new born. The caring in a mother’s caress. The wisdom in a father’s smile. The support of a friend or mentor. All contribute to our sense of growth and confidence. There is a positive gentility to being helped along by others who have our interests in mind. As we grow in maturity (or battle the oldness of our age), we still find comfort in those moments we hold so dear. Write a nurturing poem, or of a moment that had contributed to your growth. anguished breath from my chest. as a memento of her caring. from his soul; she’s come to know his heart. and love even more. Love is a seed. You plant many, but not all will blossom. to return all she gives. The balance is simple. We all face challenges in our lives. Either financial, emotional, creative, or familial, we all have our crosses to bear. Crosses? Maybe it’s a spiritual challenge. But whatever it is, it is there that we find our resilience and our strength. How one faces a challenge says a lot about that person. Do we ignore it? Do we shy away? Do we charge forward into the breech? We each have to decide the tact we take. Make no mistake, challenges can be hard and daunting. But if they weren’t, they’d be called easies! Write about challenge, personal or general. Even poets face challenges in the form of a difficult prompt, or in the form of a form that vexes them. Pick up the double-dare and poem! slower than half-fast, as I’ve discovered. down this river of dreams, or so it seems. I have uncovered my major flaw. And it gnaws at my muse, my words. Such challenges should be left unheard. And as always, we gather as poets – steeped in our words and bound by the magic we wield. Creativity is the application of the skills we possess fueled by our seeing things just a bit differently than others. If we can get others to see things from our perspective, then we have created something that the masses can embrace. And maybe it will spurn them on to tweaking our processes to another new creation. Things are ever-evolving and we have been witness to many amazing things. Creativity helps us grow in our thoughts and deeds. What is and what can be! Tell us of creativity in your own special way. translating with sketch pad and pen. my muse is excited again. The poet, the artist; the friends. They say to “keep your nose to the grindstone.” There’s a “stick-to-it” mentality that works hand in hand with the ability to achieve your goals. George Carlin once said, “Ya gotta wanna” to succeed. Do you wanna? Only you can determine if you have the gumption to attain the pinnacle. Are you driven? Write of the motivation pursuant to determination. “Never give up, never surrender!” ~Jason Nesmith (Tim Allen’s character in the movie Galaxy Quest) Keep on, keeping on and write your poem! meant to flourish into something bigger. for it to germinate and grow. now the rest is up to you succeeding. they continue to feed your dreams. Strive to climb higher and go farther! We all have an idea where we’d like to be in this life. But how badly do we want to get there? Do you have the ambition to achieve that which you desire? Ambition is a great motivator, but does it come at a cost? Does it tread on the toes of another to get what we want? If we can gain a better place and in the process, lift others up (instead of dumbing everyone down), we can indeed climb higher, go farther, all for the betterment of the human condition. Get fired up, stoke your ambition, and write your poems on how you believe your ambition motivates you! I am meant to do. What I am bound to. expressing the things that live within us. Not a soul can control what I am to do! my path paved in my intentions. my obsession. No roadblock to my success. Smile through trouble and grow though constant effort! Through our lives we learn what we do best. And we also come to know what drags us down: our strengths and weaknesses. We can choose to breeze through the good times; we might struggle through the not-so-good times. But we find it is always better to deal from a position of strength. Give it your best shot, with your best shot. Be it physical, spiritual or mental, use your strength as motivation and pen your poem! for the person on the top of the mountain did not fall there. People do not fail… they give up trying. Trust that your skill will accomplish what the force of many cannot. One who climbs a ladder must begin at the first step. when fire and water go to war, water always wins. A new destination can provide great opportunity! On a recent trip to visit my daughter up Ottawa way, I was reminded more times over that the motto of the province of Ontario is “YOURS TO DISCOVER.” How does a discovery motivate you? What discoveries have you made, or would like to make? It doesn’t have to be an earth shattering revelation. It could be as simple as finding out that you truly can stick a square peg in a round hole (if you hit it with a big enough hammer!). Take us on your exploration, and together we’ll discover what you uncover. Poetry is your Ontario. It is yours to discover. Listen. My own natural voice speaks. It was discovered quite by accident. grateful for these unexpected blessings. it took only a lifetime of reaching to realize it. Ponder the vision beheld and decipher the message. the divine beloved had been waiting inside me all along. I write to discover new worlds, to unearth buried emotions. slicing through silence with clean, cold precision. a million tiny pearls; golden treasures. hidden among the azaleas with their purple blooms. There are times that I’ve missed all that is around me. peaceful natural beauty unfolding in a peaceful and natural way. Loving freely, shared with new found friends. The earth is filled with such glory. PROMPT #230 – MOTIVATION – WHAT GETS YOU (KEEPS YOU) ON TRACK? We talk of muse. As poets, it can be our best friend. Muse is a kind of motivation. It gets us writing. So let’s get motivated. For the next thirteen Sunday prompts we’ll be inspired by various nudges of motivation. It can be the featured concept, or you may be inspired by the accompanying quote about the subject. Or come up with a quote of your own and expound on that motivation. As long as we’re on the subject, what motivates you? Write a poem about what moves you to write. Then we’ll delve into the different concepts of motivation. They have become my passion. I would fashion my thoughts into poems. But I would never show them to anyone. that lived in my linguistic pursuits. to dispatch my words into the cosmos. a feast of the rhymes I would prepare. And it is there I get my fire.